Now available in a Kindle edition! 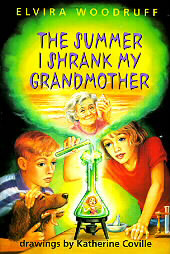 Budding scientist Nelly Brown is thrilled when she discovers an old chemistry set at her grandmothers summer cottage. The set includes everything for mixing up magic formulas, and guarantees that each child using the set can make a wish that will come true.Nelly adores her grandmother and mixes up a formula that makes her young again. But to Nellys amazement, her grandmother continues getting younger and younger. Luckily Nelly’s cousin Ben is on the way. Will they be able to save Grandma before she shrinks into nothing? Proof!